Let’s see a show of hands. How many of you have a magnifying glass that you occasionally use in order to read some fine print or view some detail on an object? I have one and my one observation about my magnifying glass is that it is never where it is needed, for instance when working out in the yard or in the garage. 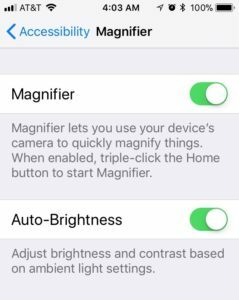 Since IOS 10, the iPhone has an easy to access Magnifier that will use your iPhones camera and flash as a Magnifier that you can use to read fine print or detail. This recipe will identify how to access the Magnifier, verify the Settings needed to make it available and a couple of essential options for lighting and focus. As Seniors, a lot of us recognized our changing eyesight decades ago. As our eyesight changes, we admit that we occasionally have to work a little harder to read the fine print. I use readers but I also happen to have a couple of magnifying glasses in my office for this purpose. There are countless situations where access to my magnifying glass allows me to read a label or pick out a detail that is unavailable to the naked eye. The iPhone provides a magnifier function that allows my to use my iPhone as a substitute magnifying glass. It’s easy. You pull you iPhone out of your pocket and press the Home button three times. Yes, it is that accessible. The Magnifier is part of the iPhone’s Accessibility functions and does not have an App or Home screen presence. This means you will not find an icon for the Magnifier. 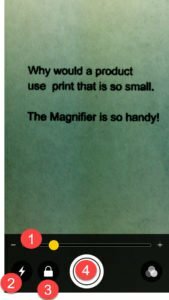 To set up the Magnifier, Go to Settings > General > Accessibility > Magnifier, then turn on Magnifier. There are two ways that you can access the Magnifier. One method is to simply press the Home button three times. The triple-click of the Home button is known as the accessibility shortcut. If the Magnifier does not start with pressing the Home button three times, it may be that the accessibility shortcut is assigned to another function. This can be change by accessing Settings > General > Accessibility > Accessibility Shortcut. You can also add an icon to your Control Center. This option is available for iPhone/iPad users of IOS 12 and later. To set up this custom icon, launch the Settings app and tap Control Center, Customize Controls. Tap the green + next to Magnifier. This will add the custom function to the Control Center. With the Magnifier launched, you will use a combination of manual phone movements and onscreen controls to capture the detail you with to magnify. Here is a review of the onscreen controls. Adjust the magnification level. Drag the Zoom Level slider. If you prefer, you can also use the pinch in and pinch out zoom gestures to control the magnification. If your image is too dark, add more light to you subject by tapping to turn the flashlight on or off. Lock the focus. Your iPhone will attempt to focus the image based on your position. If you move the iPhone, a refocus will occur. Once your image is in focus, you may want to lock the focus allowing you to move the iPhone without the refocus.Tap the padlock to lock the focus. Tap again to unlock the focus. Freeze the Frame. Tap the “shutter” button to lock the image. This will allow you to examine the magnified image and adjust the magnification and drag the image around for better viewing. Unfreeze the frame, tap the “shutter” again. Turn off Magnifier by pressing the Home button. Once you have the focus you want, freeze the frame on your image. This allows you to still change the magnification and shift the image without needing to hold the camera.